If you’ve found yourself wondering where all your once-plentiful hard drive space has seemingly vanished to, a utility like DaisyDisk Team’s DaisyDisk could prove invaluable in helping you free up long-lost disk space. Recently upgraded to version 2.0, DaisyDisk scans your disks and presents their content as interactive maps that make it easy to spot unusually large files and remove them to free up more space. Though music and video files tend to eat up most of our hard drive space, other, less obvious files, like a long-forgotten virtual machine image, a huge cache file or an old DVD movie rip, could be taking up more of your disk space than you think. DaisyDisk makes it easy to find out how your hard drive’s space is being used by giving you a color-coded, visual representation of all your mounted hard drives. From this view, you can hone in on unusually large files and determine whether or not they are needed. 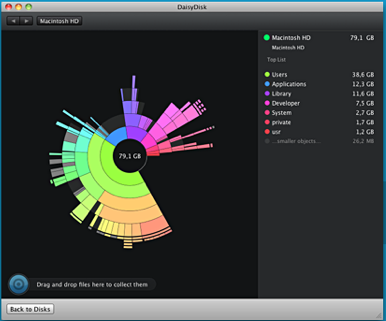 DaisyDisk 2 includes a number of improvements and new features, such as the ability to delete files in-app; a spiffier, redesigned user interface; the ability to scan multiple disks simultaneously; more effective memory usage; and a new scan progress indicator for the Dock icon. DaisyDisk requires OS X 10.5 or later and costs $20 for new users. For existing users, the 2.0 upgrade is free if you’ve purchased DaisyDisk before October 15, 2009 or after September 1, 2010. It costs $10 otherwise.